It is no great secret that people live longer today than in previous generations. 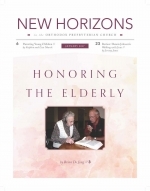 We all know neighbors, friends, family members, or fellow church members who are in their eighties and nineties. According to the U.S. Centers for Disease Control and Prevention, the average life expectancy at birth in the year 1900 was 47.3 years. By 1950, that projection had risen to 68.2 years of age. Since that time, it has steadily increased, so that today’s average life expectancy is 78.8 years (CDC, Health, US, 2015, p. 95). Parenting young children can be one of the more challenging and exhausting parts of life! Sure, when they’re young, you don’t have the more complex questions and emotions of teenage years. Certainly parents of young children are yet to deal with the complicated dynamics of relating to their children who have grown up and have families of their own. The birth of a child is one of God’s greatest gifts to Christian parents. Moments after children are born, and often beforehand, we establish the habit of reading the Bible to them and praying for them. Images of how they will grow up as godly blessings to others captivate our dreams. Johannes Schlaginhaufen, a ministerial student living in the home of Martin Luther in 1532, expressed to his mentor his struggle with prayer: “Whenever I think about God and Christ, this immediately comes into my mind: ‘You are a sinner; therefore, God is angry with you. For this reason, your prayer will amount to nothing.’ ” Luther replied to his student, “If I waited to pray until I was righteous, when would I pray? Now, then, whenever Satan suggests to you: ‘You are a sinner; God does not listen to sinners,’ you should boldly turn that argument inside and say, ‘Therefore, because I am a sinner, I pray, and I know that the prayers of the afflicted are effective in God’s sight’ ” (Wenger, The Pastoral Luther).